womanly with their smooth white arms. held in the thrall of her own knack. 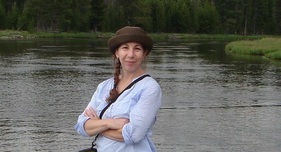 Rebecca Aronson has poem recently or forthcoming in Quarterly West, Pilgrimage, Tin House, River and Sound Review, Cimarron Review, and others. Her first book, Creature, Creature, came out in 2007. She lives in New Mexico where she teaches writing and coordinates a visiting writer series. She is a member of Dirt City, an Albuquerque-based literary collective.